Chennai, July 16, 2018: Hyundai Motor India Ltd. (HMIL), the country’s second largest car manufacturer and the number one car exporter since inception, received an overwhelming response and participation from customers for its Brilliant Moments with Hyundai Campaign. To celebrate Hyundai’s legacy and thank over 5.3 Million valuable customers, HMIL released the emotionally connecting Brilliant Moments with Hyundai first film – ‘The Deal with ACCENT’ on June 27, 2018. The campaign has recorded unprecedented engagement on social media crossing over 100 Million views in just ­­­­­­­­­­17 days of its release. Buoyed by the success of the first film “The Deal with ACCENT” - Hyundai will release the 2nd film ‘Army with SANTRO’ in the third week of July and will be promoted on Social Media and digital platforms. 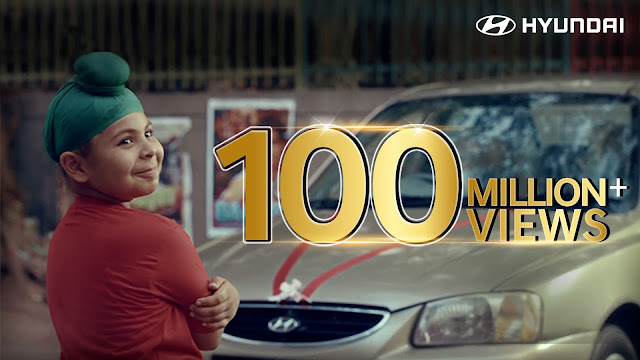 The customers of iconic Hyundai brands – SANTRO, ACCENT and i10 would be invited to share their Brilliant Memories with Hyundai through the microsite www.BrilliantMoments.in, special letter boxes at the Hyundai dealership network, email on entries@brilliantmoments.in and Whatsapp (8130121212). Top 10 #BrilliantMoments stories shared by the Hyundai customers would be made into individual films and promoted for voting on the microsite www.BrilliantMoments.in and the top 3 films with highest votes would be chosen as winners. The Winners will be gifted Hyundai cars at a mega event in presence of our corporate brand ambassador Shah Rukh Khan, domestic holiday for 10 couples and 1000 gift vouchers for lucky winners. The Brilliant Moments Campaign is an initiative to provide a unique experience through various Experiential Marketing, Sales and Service initiatives at all Hyundai Touch points and invite the customers of SANTRO, ACCENT and i10 to share their brilliant moment stories. Hyundai Motor India Limited (HMIL) is a wholly owned subsidiary of Hyundai Motor Company (HMC). HMIL is the second largest car manufacturer and the number one car exporter since inception in India. It currently has nine car models across segments – EON, GRAND i10, ELITE i20, ACTIVE i20, XCENT, VERNA, ELANTRA, CRETA & TUCSON. HMIL’s fully integrated state-of-the-art manufacturing plant near Chennai boasts advanced production, quality and testing capabilities. HMIL forms a critical part of HMC’s global export hub. It currently exports to around 88 countries across Africa, Middle East, Latin America, Australia and Asia Pacific. To support its growth and expansion plans, HMIL currently has 495 dealers and more than 1,309 service points across India. In its commitment to provide customers with cutting-edge global technology, Hyundai has a modern multi-million dollar R&D facility in Hyderabad. The R&D centre endeavours to be a center of excellence in automobile engineering.